WASHINGTON — The U.S. Army will likely use Stryker combat vehicles paired with sensors and shooters for its interim Manuever-Short-Range Air Defense (M-SHORAD) solution, the program executive officer for missiles and space confirmed. The service is looking to make decisions on what might be integrated onto a Stryker platform for such a solution later this year, Barry Pike told Defense News at an Association of the U.S. Army missile defense forum Feb. 28. It’s been well over a year since U.S. Army Europe sounded the alarm over a glaring SHORAD capability gap. The service did not have the appropriate capability to go up against small drones observed on the Ukrainian border by the Russian military, nor would it continue to enjoy the air dominance it’s had against adversaries in the last 15 years of war. The service let its SHORAD capability atrophy as it prioritized a different kind of fight in the Middle East. 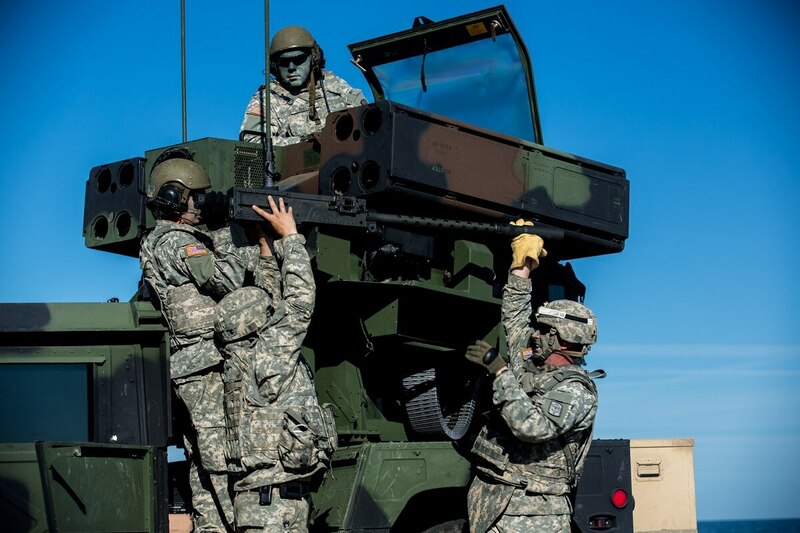 Taking heed of warnings coming from theater, the Army has moved full speed ahead to fill the gap, rapidly deploying a rotational Army National Guard Avenger battery to Europe and fielding man-portable air defense systems with Stinger missiles to units. To buy more time as the service builds a lasting solution down the road, it is looking for an interim solution, so using Stryker as the base platform for SHORAD makes sense, although the Army could expand out to other platforms. The European theater is home to the permanently forward-stationed 2nd Cavalry Regiment, which is a Stryker-based unit. The Stryker has proved itself for many years in theater as an appropriate and effective combat vehicle in the region. The Army expects to have its first Stryker-based SHORAD battery within two year’s time, reaching an initial capability in fiscal 2020, according to Pike. When it comes to solutions for the SHORAD Stryker, there are many. 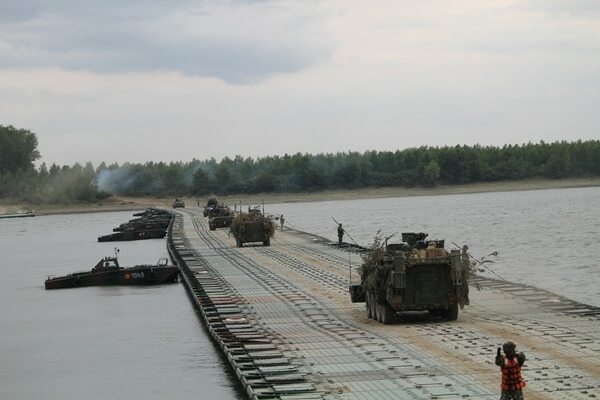 Vendors have come out of the woodwork in the past year with ideas on how to rapidly bring about an interim SHORAD system. The Army hosted four vendors at a demonstration at White Sands Missile Range, New Mexico, in September 2017. Two international companies brought solutions: Israel‘s Rafael demonstrated Iron Dome, an South Korea’s Hanwha showcased its Biho Flying Tiger air-defense system. The other solutions at the demonstration were integrated onto Strykers. General Dynamics — Stryker’s maker — and Boeing brought an Avenger launcher mounted on a Stryker and also fired Lockheed Martin’s Longbow Hellfire missiles. Orbital ATK demonstrated its Mobile-Anti-UAS Defense System (M-AUDS) — a combination of Liteye’s counter-drone defense system, a nonlethal electronic-attack radio-frequency jammer and a gun with guided and air-burst munitions mounted on a Stryker. Orbital is no stranger to Stryker integration efforts, having just provided the 30mm cannon for up-gunned Strykers that have recently arrived in Europe. Other companies came forward at the annual AUSA conference in October with ideas to get after the SHORAD gap. BAE Systems pitched an early version of its Bradley fighting vehicle with an air defense history — the Linebacker variant — with search and fire-control radars, a jammer, and a 30mm cannon with an air-burst munition for kinetic kills. Oshkosh integrated a SHORAD capability onto its Joint Light Tactical Vehicle, and Lockheed showcased the utility of its Q-53 counter-fire radar for the mission. Raytheon, in a separate test, fired Stinger missiles from Stryker to demonstrate a SHORAD capability at White Sands last fall. The Army is leveraging the information garnered from the demonstration at White Sands as well as other efforts within air and missile defense program offices and the new cross-functional team, or CFT, in charge of such a program. The service recently established these CFTs to help rapidly advance its top six modernization priorities through its new Futures Command expected to stand up in the summer. “The effectors and sensors that go on [Stryker], we probably still have some time to figure out exactly what that configuration will be, but we are assuming there will be some mix of electronic warfare, guns, missiles and potentially lasers over time,” Pike said. The Army’s FY19 budget request states the service is going to assess the possibility of putting a 50-kilowatt laser onto its SHORAD in less than five years. Pike added the Army will look to take advantage of the massive amount of development on the counter-unmanned aircraft systems realm, too. Much of the solutions are being developed in a fast battle-rhythm in response to joint urgent operational needs statements for a counter-UAS feature capability integrated onto mine-resistant, ambush-protected vehicles. Orbital has actually fielded a tripod-mounted version of its system to the U.S. Central Command area of operation and planned to mount it onto an MRAP all-terrain vehicle for added mobility. “My belief is a lot of those same sensors and shooters could be applied to M-SHORAD, just on a different vehicle,” Pike said. Meanwhile, a massive effort is underway to revive mothballed Avenger systems. “Army Materiel Command is providing outstanding support in this effort by inspecting and overhauling legacy Avenger systems that were literally in a field in Letterkenny, Pennsylvania, set for disposal in order to create 72 fully functional Avenger sets in order to support [U.S. European Command] mission requirements,” Lt. Gen. James Dickinson, the head of Army Space and Missile Defense Command, said at the AUSA missile defense event. He added the Army is ahead of schedule to deliver two Avenger battalion-equipping sets to Europe this year in support of the European Deterrence Initiative. Personnel and infrastructure to establish an active component Avenger battalion will fall in next year. And the National Guard’s Avenger batteries will continue to operate on a rotational deployment schedule. Brig. Gen. Timothy Sheriff, the National Guard’s 263rd Army Air and Missile Defense Command chief, told the same audience at AUSA that his outfit moved fast to put a battery back in Europe, but is also thinking ahead on the impact of the Army’s effort to rebuild a SHORAD capability. The Army will establish seven battalions with Indirect Fire Protection Capability in the 2024 time frame, with essentially four battalions around 2021 or 2022. That will bring counter-rocket, artillery and mortar as well as counter-UAS and counter-cruise missile capabilities to the service.